Painting of the French artist Jacques Louis David “Antiochus and Stratonica.” The size of the painting is 120 x 155 cm, canvas, oil. Another name for the picture “Doctor Erazistratus reveals the cause of the disease of Antiochus passion for his stepmother Stratonica.” In 1774 David participated in the competition for the Roman Prize, which granted the right to become a pensioner of the French Academy in Rome, and receives it for the canvas “Antiochus and Stratonica”. The plot is interpreted in the spirit of the graceful antiquity of the teacher Jacques Louis David of the artist Joseph-Marie Vien, with a slight tinge of frivolity and ambiguity. Antiochus is the name of many kings of Syria from the Seleucid dynasty, of Macedonian origin. The son of the first Macedonian, and the commander of King Philip, known under this name, Seleucus, became the ancestor of the kings of Syria. The son of Seleucus and the Sogdian princess of Apama, Antiochus I Soter, was born in 323 BC. The love of his stepmother Stratonica plunged Antiochus into a dangerous disease; after comprehending the cause of the latter, the royal physician-physician Erazistrat opened it to his father, and the latter gave his young and beautiful wife Stratonica his son. Entering the throne, Antiochus in 281-261 BC vainly tried to re-conquer Pergamon, a breakaway from Syria; also the efforts of Antiochus from 277 BC to drive out the Celts who invaded Asia, were crowned with success only half. Then Antiochus began a war with Ptolemy Philadelph, who conquered all Syria to Damascus inclusive. 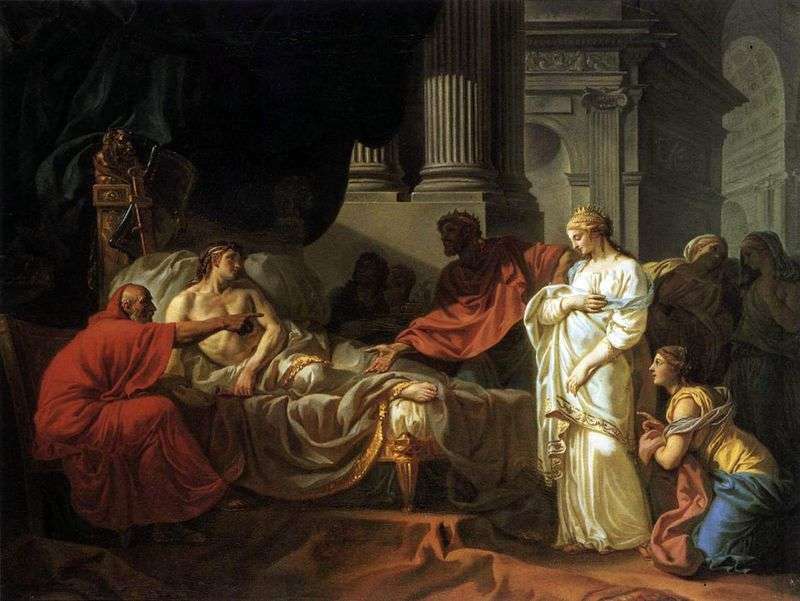 Description and meaning of the painting Antiochus and Stratonica by Jacques Louis David.